“A hospital will never be home, but it’s within the bounds of possibility for it to feel like something you’d find in a four-star hotel: a space that a patient or visitor can be comfortable in,” Nitch said. The days of gazing upon an ambulance riding the tide of rush hour traffic en route to getting a patient specialized care have left Eastern Jackson County. “Now, the only reason I suspect anyone would want to hitch a ride on an ambulance into town would be for sight-seeing purposes,” said Dan Davidson, public relations director of the Centerpoint Medical Center. 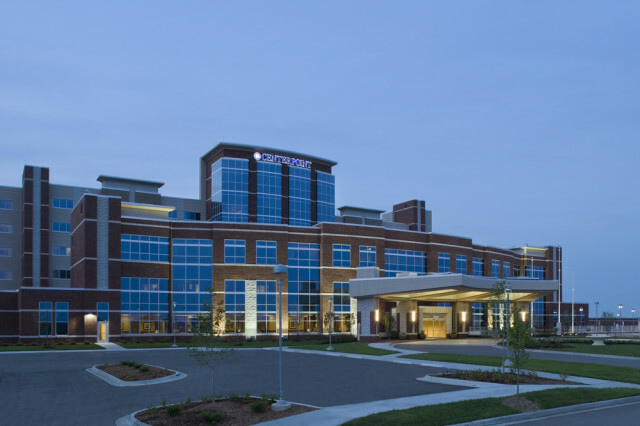 On May 6, Centerpoint Medical Center, a 440,000 square-foot acute-care hospital located between Little Blue Parkway and Jackson Drive at 19600 E. 39th St. in Independence, opened for business. The medical office building, which opened in June of last year, is adjacent to the Centerpoint Medical Center and provides a premier outpatient rehabilitation center, an imaging center, a wound care facility, and the Centerpoint Ambulatory Surgery Center. The state-of-the-art Centerpoint Medical Center – at $250 million, the costliest ground-up hospital construction in Missouri’s history – is the only hospital in Eastern Jackson County to offer a Level II trauma center and a Level III neonatal intensive care unit and it features an accredited chest pain center. The 257-bed medical center is part of the HCA Midwest Health System, which includes 10 hospitals and related healthcare facilities in the Kansas City area. enterpoint broke ground in April 2005 to replace the outdated Independence Regional Health Center and Medical Center of Independence. Matthew Nitch, architect for Earl Swensson and Associates, said one of the mitigating factors for Centerpoint’s location was landmark potential. “We wanted 90 acres of land atop the highest elevation to make it plainly visible for miles around,” Nitch said. As for the exterior aesthetics of the building, Nitch turned to some of the historical buildings near the Independence Square for inspiration. Nitch said the use of tucson-colored stucco in addition to a dark blue glass exterior yielded the appropriate look. The abundance of glass had another purpose, too. “We wanted as much natural light to filter into the upper floors [where the patient rooms and women’s center are located] as we could,” Nitch said. In patient rooms, a triple window 10 feet wide and five feet high allows for sunlight to bleach the room, making it seem bigger and help patients and visitors feel more at peace. Hospitality and functionality were the intentions of the interior. The greatest challenge was sustaining the hospitality element while also working to ease the burden of doctors and nurses, Nitch said. An example of this duality is the lobby, which is as large as any found in a hotel. It is glutted with “the coziest, most tactful furnishings we could get our hands on,” Davidson said. But it also functions as a point of departure for other parts of the facility. Whereas in other hospitals disorientation is a major concern, at Centerpoint everything is strategically arranged to maximize clinical productivity. For instance: on the first floor, the emergency department is next to the imaging department and the imaging department is next to the cardiac catheterization lab, which adjoins the surgery sector. Such interdepartmental organization also eliminates the game of hide and seek most visitors have to endure. The sheer size of the lobby was also a necessity. As the hospital ages and grows – an additional 10 stories are planned – the lobby will forever remain the central hub. So, though it might seem extraordinarily large today, the size will ultimately conform to the spatial demands of expansion, said Nitch. longside blue ribbon medical services, Centerpoint also has top-flight luxuries for patients, visitors and staff alike. Each patient is treated to a private room with flat screen televisions that offer educational programming specific to the patient. For example: If a patient is suffering from pulmonary cardiovascular disease and is a smoker, a program alerting the patient to the dangers of smoking and tips on how to quit might be offered. Valet parking, concierge service and room service are also available. On the clinical side, Centerpoint is on the cusp of cutting edge technology. With wireless internet available anywhere on-site, part of Centerpoint’s computer system is integrated, which allows for a patient’s data to remain easily accessible to any nurse or doctor as the patient drifts from department to department. All images are scanned and displayed digitally, permitting doctors a three dimensional examination of the matter in question. At Centerpoint, nurses have all of the tools they might ever need at a patient’s bedside. Each bedside is equipped with its own point-of-use room as well as a scanning system called E-mar (Electronic Medication Administration Record) that allows nurses to ensure medication safety for each patient. Also, if a nurse is lacking certain supplies, all he or she has to do is scan the barcode and, within minutes, a new reserve of materials will arrive. “Nurses have more to worry about then restocking and inventory,” Fetters said. If a patient is registering irregular health symptoms, and the nurse is elsewhere, a state-of-the-art alarm notification system will alert a monitoring technician, who will then notify a central communications specialist who will, in turn, page the nurse. Average response time is 10 seconds as opposed to 40 seconds with traditional monitoring devices. wo disadvantages plaguing the Independence Regional Health Center and the Medical Center of Independence were spatial constraints and innovative impracticality, said Susan Stiles, chief nursing officer. In building a hospital from scratch, technological advancements are possible that otherwise wouldn’t be if “you’re putting band-aids on existing facilities,” Davidson said. It was estimated that the cost to bring Independence Regional Health Center and the Medical Center of Independence up-to-date would have far exceeded the price tag of Centerpoint, Davidson said. Centerpoint’s founding has siphoned some of Kansas City’s finest specialists – doctors with the kind of pedigree patients from Eastern Jackson County used to seek downtown.